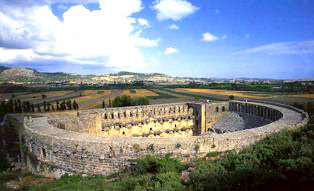 Aspendos is known for his best-preserved theater of antiquity with seating for 15.000. Still used today, the theater's galleries, stage decorations and acoustics all testify to the architects success. Nearby stand the remains of a basilica, agora and one of the largest aqueducts in Anatolia. This city on the shores of the ancient Eurymedon,built by the colonial people from Argos,is renown over the world because of its Roman amphitheater of incrediple beauty,that is still in excellent shape .Aspendus was the only city,besides Side,that minted silver coins in 5th C.AD.The city walls were built in the Hellenistic period and were repaired restored in the late Roman period and in the Byzantine period.Aspendos is divided into two:Lower City and (Upper)High City.The Agora,Basilica,Bouleterion and the monumental fountain situated in the High City and the Theater,Stadium,the Roman Baths and the Water aqueducts situated in the Lower City are definitely worth seeing.The Aspendos Theater holds 15,000 people and was built by the famous Aspendosian architect Zenon,in Marcus Aurelius�time(secondhalfof2AD). 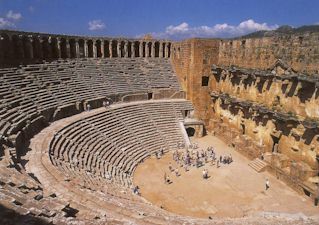 This theater is in better condition than all other theaters built in the ancient times .In order to keep with Hellenistic traditions,a small part of the theater was built so that it leaned against the hill where the Citadel (Acropolis)stood,while almost all of the other parts were buit onvaulted arches . The high stage served to seemingly isolate the audience from the rest of the world.The very top section of this stage has been repaired and the acoustics were ameliorated with later additons .Because the stage area was later used as a caravansarai in Seljuk times,it was continuously repaired and maintained .Thus,the Aspendos Theater has been able to survive to this days without losing almost any of its original qualities.